We will either call or text* you directly or you can check our Job Posts. We are excited to announce our new online registration process! To register, just fill out your information on our website, then make a reservation to visit our Atlanta office to complete paperwork and take your casting photo. To read the full instructions and begin the online registration process, visit our Register page. THERE WILL BE NO PHOTO UPDATES TODAY THURSDAY 4/18/2019! Head on over to our Central Casting Georgia Instagram page! We will now be posting content regularly that is specific to Georgia on IG. Keep an eye out for show announcements, casting notices, FAQ’s, and more. Please like, share, comment and tag your friends & family and encourage them to follow our IG and stay tuned for our first IG giveaway! Central Casting (Georgia, USA) shared a link. 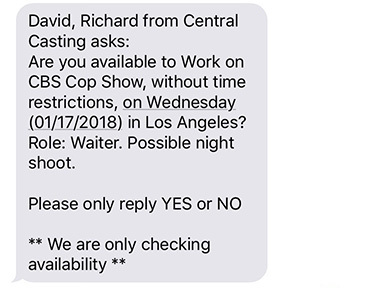 There are many ways for you to find background acting work, here's our process for submitting your availability via the After Hours Availability List. Registering with Central Casting in Georgia and Louisiana just became easier. We are excited to announce our new online registration process in these offices! To register, just fill out your information on our website, then make a reservation to visit your local office to complete paperwork and take your casting photo. That’s it! You’ll save time and be one step closer to set. We are excited to announce that we've rolled out an online registration process in our Georgia and Louisiana offices. Here's everything you need to know. Central Casting (Georgia, USA) shared a post. Want to know what it was like casting Avengers: Infinity War? Casting Director Alyssa shares her stories about working on the film. Have questions about how Background Actors get paid? Our paymasters have all the info you need for getting paid by Central Casting. Central Casting (Georgia, USA) updated their profile picture. Central Casting (Georgia, USA) shared a video. Central Casting (Georgia, USA) updated their cover photo. Congrats to BRITTNEY ALLEN!!!! You've won our Limited Edition Central Casting Hat! TGIF!!! Here is the second of TWO videos today!!! Today's second NEED TO KNOW is about Lost and Found while working on a set for Central Casting. Regularly check this calendar for the Central Casting Georgia office. Minors can register by coming to a New Registration Onboarding session with a parent/legal guardian and their required documentation to accompany the I-9 form. You can come in during Re-Registration and Updates to add photos and make profile updates. It’s important to keep your file current so Casting Directors know your look and details. You must also re-register every two years to be able to work on our productions. Call 404.920.8011. If you cancel, we ask that you give us enough notice to replace you. PLEASE NOTE: You may not cancel via text message. You must call our office. It is critical that you write down your work information. If you lose your information or if you have any questions regarding your work information call 404.920.8011. You can either fax or mail us your stop payment request. You will need to specify in writing that you are requesting a stop payment and include your name, Social Security number, address and signature, along with the work date and show name for the check you are missing. If the net of the check is over $150, you will need to sign a bank form supplied by our department and have your signature notarized before we can place a stop payment. A digital photo of you can be taken in our office when you come to update your profile. If you would like additional photos added to your profile, bring the photos to an update session. Only hard copies of photos will be accepted. We cannot accept discs, CDs, or memory sticks. Photos submitted will not be returned. You can change your status during update times. You must present your identification along with your current SAG-AFTRA card or receipt issued by SAG-AFTRA and fill out a data change form. If you would like to update or change any information you can do so during update times.